No kangaroos this morning but I do have a story. To begin, I have traveled all over the world and I have never felt unsafe or that my life was in danger…now this. A couple of nights ago, Thursday the 12th, I took the train back to Parramatta from St. Mary’s. Some nights I walk and some I take a taxi back to the flat. This night I decided to walk. That evening the weather was nice and Church Street, the main drag through town was busy. There are many restaurants with outside tables, café style, that line the street near the river. I decided to stop and have a beer. I’m in no big hurry to get back to the flat. Now, across the river and nearer the flat is a bar, the Royal Oak Hotel. It has a “bottle shop” where you can buy beer, wine, etc., and, of course, a bar. This place is nothing fancy, just a neighborhood gathering place…or so I thought. 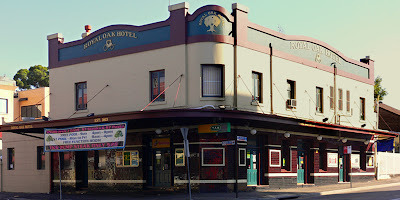 Here’s picture of the Royal Oak Hotel. It sits at the corner of Church and Ross in Parramatta. The side with the sign is on Ross St. I enter and go around to the bar and order a Toohey’s New, one of many nice beers they have here. Around the bar are about 5 young guys drinking. They’ve been there awhile, along while. I take a seat off the bar and everything seems okay. I’m sitting on a stool with my back to the wall. On the wall is a ledge to sit your beer. To my right is the entrance to the poker machine room, all bars have them. Past this is a small area with a couple of tables and a side exit/entrance to Ross St. To my right is a small wall jutting out. Around this wall is the men’s toilet and the main back area of the bar leading to the garden area and pool room. Finishing my beer I order a second and sit back on my stool. A minute or two later two young guys, Samoans, walk in the side entrance. These two didn’t come in to have a beer and socialize; they were “looking” for someone, another Samoan. Now this is where the story gets interesting. The 5 young, and rowdy at this point, guys start yelling, telling these two “intruders” to leave. I guess they weren’t complying fast enough because the “5” start chasing and shoving them out the door onto Ross St. About that time this guy, the Samoan in question, appears from around the small jutting wall. He’s wearing a t-shirt and cargo pant type shorts. In the next second he pulls a 9mm semi-automatic out of one of his pockets and pulls the slide back. Now one of the drunkest of the “5” sees the gun. He runs up to the Samoan and wrestles it from his hand. This is all happening not more than 3 feet in front of me and the gun is COCKED. This idiot, with cocked gun in hand, runs for the side door. When he reaches the door he immediately fires 4 to 5 rounds down Ross St.
Now, I live in Texas, the land of the cowboys and the idiot wannabes. This made everything I’ve seen pale in comparison. Needless to say I left as fast as possible, sirens screaming in the background. I’ll not be going back to the Royal Oak Hotel, at the moment it is closed. I’m sure the police have a few questions that need answers. I’m sure the girls behind the bar that night know most of the answers. I’m sure they will be looking for new jobs. I’m hoping these idiots will be found.